Some days Walt Disney World is about taking a mine train through bat caves and beautiful caverns, finding trolls, listening to a purple dragon, taking an unexpected side trip on your way to Endor, and finding a way to stop the poachers in Harambe, some days. Other days, and perhaps the more important days, Walt Disney World is about who you are with and where you are, and that's it. I'm fortunate to have more of the latter. 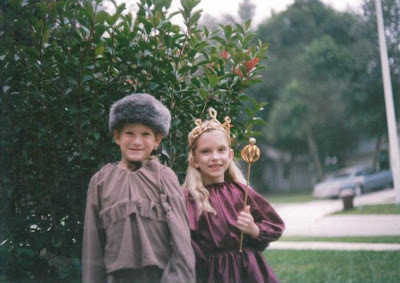 Growing up with Walt Disney World in my backyard, it has always carried traditions with it. Some of my fondest memories include Walt Disney World, but could have been anywhere. Watching fireworks with my sister, setting up a campsite with my dad, my mom dragging me into shops I didn’t want to go to (but now frequent myself), talking with my brother-in-law about a place he’ll never get to visit, and watching my wife getting giddy and excited about something I love. Over the past year or so, the list of Disney memories have grown to include settling down with ice cream to watch a parade with Glenn, hanging out with a couple of guys watching their wives and their friends dance up a storm while they chat and have a few drinks, going to a movie with people who are as passionate about a little robot as I am, meeting people I talk to almost every single day (some from an ocean away) for the first time, finding a redhead who you can be listed as an accomplice to in a heist, and taking in some night photography or egg rolls with Greg, who has become one of my closest friends in a very brief period of time. These are the people who mean the world to me, and though I won’t get to sit down with all of them at the table today, they always have a seat at the table in my heart (as corny as that may sound). I have a lot of other things to be thankful for. First and foremost are all of you out there. I am more thankful than you could ever imagine that you daily come to read the few lines I jot down. Your loyalty and feedback, even critical feedback, keeps me going. I am thankful that, because of the Main Street Gazette and its readers, other doors have opened up to me, like guest appearances on the WDW Radio Show and All About the Mouse podcasts. I am thankful for all of these things and so much more, thank you for continuing on this crazy journey with me. I hope that each of you are able to count upon more than just fingers and toes how many special people there are in your life. I hope you take some time today to tell them how much they mean to you. Each and every one of you out there are very special to me, and I hope you have a good meal, with great company, no matter where you are today. And if you happen to be in Walt Disney World today, say hello to Mickey Mouse for me, he’s pretty special too! Happy Thanksgiving... wishing all the best for you and your family, Richard. I am innocent! I just got around to reading this lovely post. Thanks! You are a great friend and I can't wait to see you again in a couple of days. This is a wonderful post Ryan.